World Monuments Fund leaves Syria (and the Middle East) off its 2016 Endangered Sites list. Heritage for Peace is proud to launch its third volume of international actions, listing the important work of the Syrian people and the international community to help save Syria’s heritage. This volume and prior volumes covering the period from March 2014 to September 2015 can be found here. 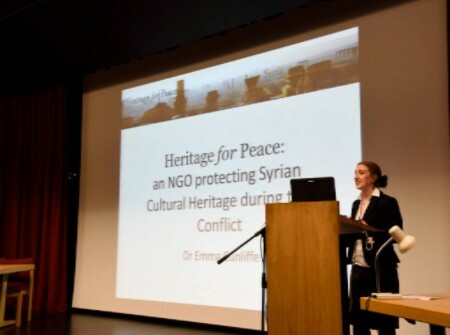 On 31 October, Dr Emma Cunliffe gave a talk about the NGO at the Conflict and Cultural Heritage conference held at Oxford University. Podcasts will be available soon on the conference webpage. The DGAM reports the death of one of its members, Ismail Mohammad Ali, on October 11 2015. The DGAM claims that Mr. Ali was killed by Daesh militants. See the DGAM announcement about Ismail here. Heritage for Peace offer their sincere condolences to his family. 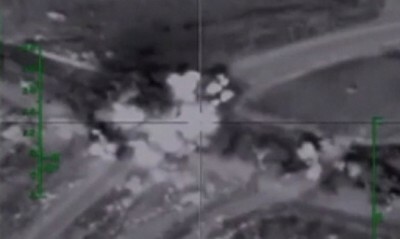 On November 2 2015 Palmyra News Updates reported airstrikes on the citadel at Palmyra. See also the report in the Guardian on November 2 2015 here. The Association for the Protection of Syrian Archaeology provided a video of the destroyed arch at Palmyra on November 2 2015 here. The DGAM reported on November 3 2015 further vandalism and damage to the site of al-Bara, in the ‘Dead Cities’ region of northern Syria here. Franklin Lamb examines the work of Syria’s ‘Monuments Citizens’ to safeguard their heritage on October 29 2015 here, having met Syrians who pose as buyers for looted antiquities, and others working in teams with 3D cameras. 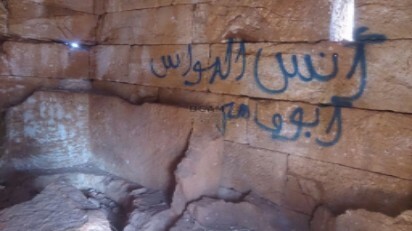 H4P has posted an article about Maaloula, by a group who have been documenting Syria’s heritage sites since 2008. See it here. Khaled Assad, has been given a memorial, reports the DGAM on October 28 2015. A digital booklet commemorating his life has been produced by the DGAM here. A Syrian activist, together with an international team, has launched a new project to 3D model Palmyra. #NEWPALMYRA. The first models are already available on their website. They are looking for contributors of all sorts: 3D modelers, archaeologists, artists, curators, developers, educators, journalists, researchers, wikimedians. Check out their website. Huffington Post on November 4 2015 examines efforts by the US Congress to limit Daesh’s profits from antiquities trading here. More details on the proposed laws can be found in the recently released Heritage for Peace International Actions Report (Vol 3). On October 29 2015, it was announced that the British Museum and the UK Government have established a $4.5m / £3m scheme for rebuilding and conservation of damaged monuments in Iraq, a scheme that they hope one day to extend to Syria. For details, see here. Read more about the Watch List here. ASOR’s Cultural Heritage Initiatives weekly report 55/6 is now available, under the title “Planning for Safeguarding Heritage Sites in Syria and Iraq.” It can be found here. The Independent wonders if we should ‘preserve ruins’ on November 4 2015. The Times-Picayune (New Orleans) looks at the work of heritage expert Tess Davis on October 28 2015 here. DW.com looks at illegal looting on October 26 2015 here.